Announcement Capture priceless memories with unique Wedding Mad Lib guest book alternatives! Upon payment confirmation, you will receive an email from Etsy with a link to immediately download your items! Proofs are typically emailed within 2-5 business days. Unlimited proofs are included at no charge! Upon final proof approval, printed orders will be shipped out within 7-10 business days. USPS Priority Mail typically delivers within 2-3 business days within the US, and 6-10 business days (plus customs clearance) for international orders. If your wedding is less than 2 weeks away, let me know and I'll do everything I can to expedite your order! All other items (including SAMPLES and TABLE NUMBERS) typically ship out within 5-7 business days. Stylishly invite your guests with handcrafted wedding invitations! I am accepting reservations for 2019! I book up VERY quickly in Spring and Summer, so as soon as you decide to place your order, let me know and I'll schedule your completion date! 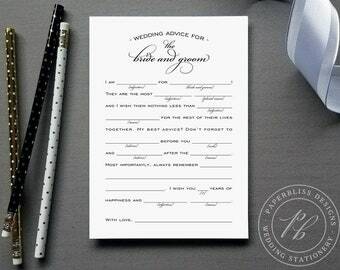 Capture priceless memories with unique Wedding Mad Lib guest book alternatives! This shop is completely MIA. Waited many weeks for a response to change one small thing on this pdf for me. I like this mad lib, but no one that completely ignores their shop deserves a good rating. If you want anything other than an instant download, DO NOT ORDER from this shop. Too light. Could not make out a lot of words. I am currently accepting orders for 2019 weddings! Please contact me with your wedding date, and I will schedule your completion date. Completion dates are scheduled to allow exclusive production time for your order. We recommend scheduling your completion date for approximately 10-12 weeks prior to your wedding date (so place your order 15+ weeks prior to your wedding). Convo or email us, and we will chat about what will work best for you! • DESIGN & PROOFING – 7-10 business days, plus added time if additional rounds of proofs are requested. • PRODUCTION – 5-15 business days after proofs are approved, depending on invitation suite. • SHIPPING – 3-7 business days within the USA. • RUSH ORDERS – Please inquire about availability prior to purchase. When you place your custom order, I will provide you with a quote for a “completion date” for in-hand delivery of your final invitations. COMPLETION DATES are scheduled to allow exclusive production time for your order. Completion dates fill quickly for Spring and Summer weddings, so as soon as you know you will be ordering, I recommend placing your deposit and securing your completion date! I generally recommend scheduling your completion date for 10-12 weeks prior to your wedding. Invitations should be mailed to your guests 6-8 weeks prior to your wedding, so factor in plenty of time to stuff and address your envelopes when choosing your completion date. THE PRICING GUIDE shown in the listing describes what is included in each wedding invitation set. Each set can be tailored to fit your unique needs. Additional features can be added onto any set, including lined envelopes, rhinestones, belly-bands, info cards, ceremony and reception stationery, etc. EVERY INVITATION is available in any combination of matte, metallic or luxe textured cardstocks, ink colors, fonts, layouts... Everything can be customized to suit your occasion! Your invitations should be PERFECT, so I’ll work with you until everything is exactly right! 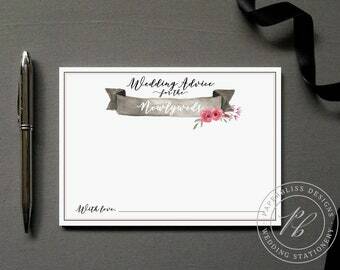 ALSO AVAILABLE are matching Save-the-Date cards, reply sets, reply postcards, reception and information cards, printed return address, guest addressing, envelope liners, table numbers, menus, programs...everything you need to create your perfect stationery suite. We really want you to be happy with your order! We will work with you to perfect your proofs before your order is finalized. It is your responsibility to proof your order carefully and confirm all dates, times, spellings, colors, fonts, designs, etc. Once proofs have been approved and digital files have been sent or in-house printing has begun, the order cannot be changed or cancelled. In the event that an error has been made by the customer, a re-print may be done at a 25% discount. If an error is made by Paperbliss Designs, we will correct that item at no cost. Please report all errors within 7 calendar days of receipt of delivery. Instant download digital items are not eligible for return or refund. - PURCHASE the listing you want. Payment is due prior to any design work. Once design work has begun, a cancellation will result in a partial refund. - PRINTED orders: Upon final proof approval, printed orders will be shipped out within 7-10 business days. USPS Priority Mail typically delivers within 2-3 business days within the US, and 6-10 business days (plus customs clearance) for international orders. If your wedding is less than 2 weeks away, let us know and we will do everything we can to expedite your order! - SAMPLES are available for all invitation sets, and the sample cost will be credited towards your custom invitation order. - A DESIGN RETAINER is due before any design work begins. This retainer is non-refundable, and will be applied towards your total balance due. - 50% PAYMENT is due upon final proof approval. Once payment is received, printing and production will begin. The order cannot be changed or cancelled beyond this point without incurring additional costs. - REMAINING BALANCE + SHIPPING is due once production has been completed. Upon receipt of final payment, your order will be shipped. All orders are shipped via FedEx, USPS Priority Mail or First Class Mail with tracking and delivery confirmation. Shipping time is typically 2-5 business days within the US. Orders outside the US take 6-10 business days via Priority Mail (or more, depending on destination and mail class) for delivery, plus customs clearance. Can I choose different colors for my custom wedding invitations? YES! Every single invitation design can be customized for FREE! When you purchase a sample set, include your wedding colors in the “message to paperblissdesigns” box at checkout, and I’ll send you a variety of coordinating cardstock swatches for you to mix-&-match to create your perfect custom invitation! When you place your final custom wedding invitation order, wording, ink colors, typestyles and papers can all be customized to help you capture the unique spirit of your wedding. Samples are pre-printed and CANNOT be customized. How long do custom wedding invitation orders take? On average, custom invitations take about 4-8 weeks from design-to-delivery, and can vary based on which invitation suite you choose and how many rounds of proofs you request. When you place your custom order, I will provide you with a quote for a “Completion Date” for in-hand delivery of your completed invitations. 15-20+ weeks prior to your wedding: Place order. You will receive up to 4 rounds of proofs so you can be sure everything is exactly right before any printing is done! A "Completion Date" for your invitations will be established when you place your custom order. Completion dates are scheduled to allow exclusive production time for each order. You tell me what date you would like to receive your completed invitations, and then I’ll schedule benchmark dates for the design/proofing/production process to make sure everything proceeds smoothly. These dates will be noted on your order quote, and can be adjusted as needed to make sure that you have everything in your hands exactly when you want! When should I mail my wedding invitations? 6-8 weeks prior to your wedding is the ideal time to mail your invitations. If you are having a destination wedding or your wedding will take place during a busy time of the year (like during summer vacation season or over a major holiday), send them closer to the 8 week mark. If most of your guests are local or you’ve already sent save-the-dates, 6 weeks prior is just fine. If your guests will need to make travel arrangements, a Save-the-Date card is a thoughtful way to make sure they have plenty of time plan! Save-the-Date cards can be mailed anytime from 3-12 months prior to the wedding.